00:00:16.17	people develop gray hairs earlier than others. 00:00:19.00	And centenarians tend to run in families. 00:00:32.26	and others will have degenerative diseases in our 50s. 00:00:48.23	we age? The short answer is no. 00:00:53.25	everything when it comes to aging. 00:00:55.29	Then what else could be contributing? 00:01:01.08	could be in our genes was hard to imagine. 00:01:07.17	thought it may be possible. 00:01:12.12	processes were controlled by genes. 00:01:49.05	aging may take place more quickly. 00:01:58.18	aging may take place more slowly. 00:02:11.22	simple organisms with a lifespan of 2-3 weeks. 00:02:27.00	or modifications to genes, and examine the response. 00:02:34.04	mutations to genes in the C. elegans worm. 00:02:52.25	correctly when the worms are at higher temperatures. 00:03:09.17	the worms to a higher temperature of 20C. 00:03:42.21	they were living longer and healthier. 00:04:03.21	delayed aging. But what is DAF2? 00:04:10.04	like it does in worms? 00:04:14.14	responds to insulin-like signals. 00:04:24.28	metabolism, and energy storage. 00:04:40.21	pathways to ensure their cells and DNA remain healthy. 00:04:57.20	mice and flies live longer as well. 00:05:14.16	in our species, as well. 00:05:25.12	as long as wild-type." 00:05:35.17	insight into the genetics of aging. 00:05:43.17	to delay or even prevent the effects of aging? 00:05:55.18	aging, and increase our healthspan. 00:06:09.09	bringing the world's best biology to you. Why do some people age more quickly than others? 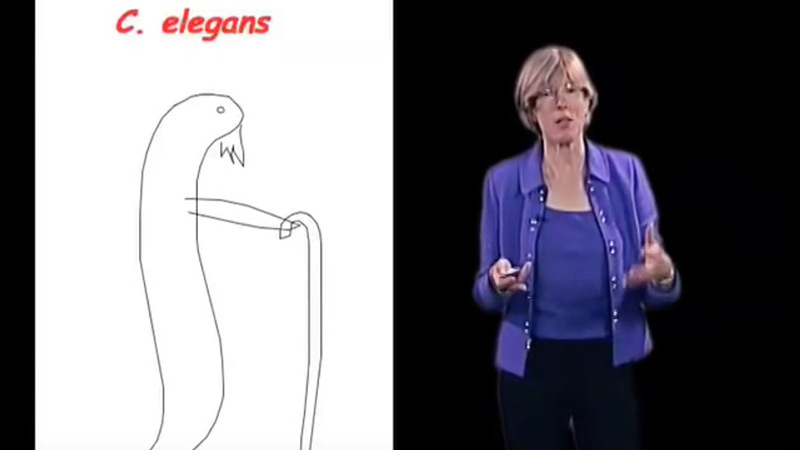 This video describes pioneering research performed by the biologist Cynthia Kenyon, who hypothesized that genes could control the rate of aging. To figure out which genes regulate aging, scientists in Dr. Kenyon’s lab made mutations in the DNA of a tiny worm called C. elegans and looked to see which mutations caused the worms to live longer, healthier lives. Amazingly, modifying just one gene, called Daf-2, allowed the worms to live twice as long as normal. Daf-2 is a conserved gene found in flies, mice, and humans, so its activity may regulate aging in our species as well.